Ya'Acov's latest extra-ordinary CD of shamanic drum journeys: 5 journeys: 1) Morning Song – Bridging the Sleeping & the Waking Dream, 2) Body Prayer - an elemental journey 3) The Unbroken – Journey to the heart of the Amazon to meet, re-awaken and deepen your connection to the unbroken source of life 4) Shaman’s Song – 11-minute strong, fast drum journey without spoken guidance 5) Night Song – At the end of the day, a jewel of a meditation journey to help you let go, and bridge the waking and the sleeping dream. All tracks are also presented without the guidance as instrumental tracks. 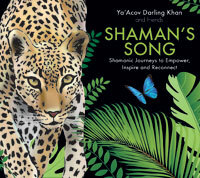 Shakapa: Ya’Acov Darling KhanYa’Acov Darling Khan is the real thing; an impeccable shamanic guide who will take you deep into the heart of existence. The safe, steady heartbeat of the drum and his warm, evocative voice will enchant and renew you, as you make these powerful visionary journeys. "Dovetailing perfectly with the teachings from his (new?) book, Yaacov offers brilliantly produced pieces of music, spoken word and shamanic soul to guide you into the day, night and deep within. Treat yourself: journey deeply, guided by a real shaman." "I'll never forget the first time I heard Yaacov Darling Khan lead a meditation with his shamanic drum. Instantly I was transported to another realm where I met my guides, received healing and was filled with inspiration. Yaacov is the real deal and is doing incredibly sacred work that the world needs more than ever. Let him guide you deep into the truth of who you are." Shamans song is a completely sensory experience which cuts through the mind and takes the listener straight into their spirit. Incredibly powerful, prepare to venture to the Amazon if not in body, very much in soul.